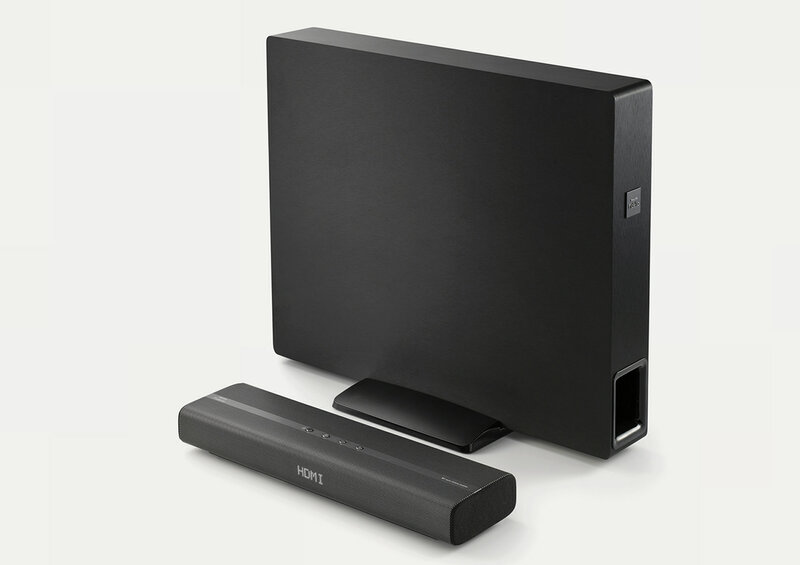 The Philips Fidelio Compact Soundbar­­ is an immersive 5.1 cinematic sound system designed in a one piece compact form factor. 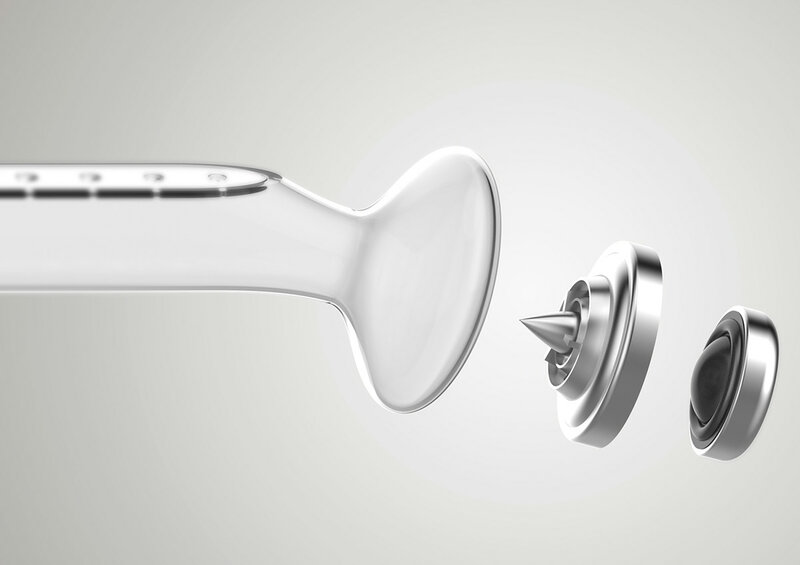 The intent of the sound concept is to create a wide sweet spot for listening. On the subwoofer, a bandpass design allow the woofer driver to besealed and hidden inside the wooden box to achieve a seamless clean design. 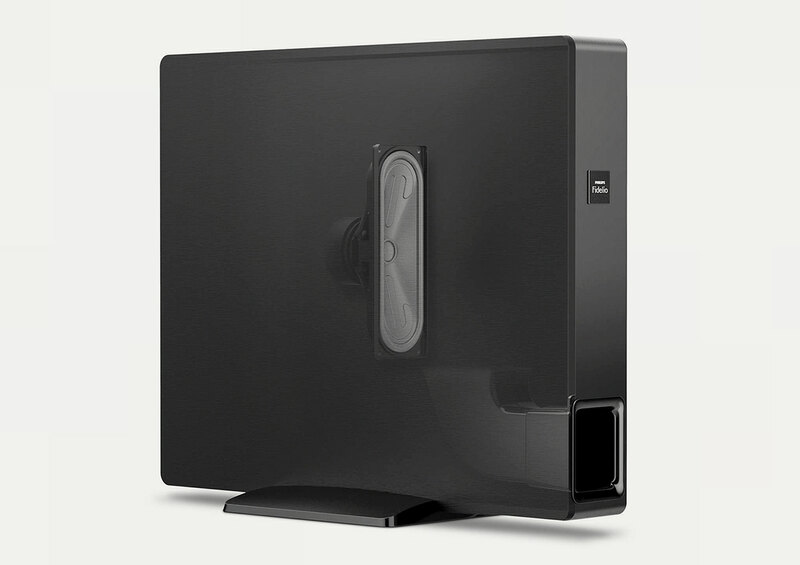 The low profile box design offers versatile placement for either free standing or placing under furniture pieces. 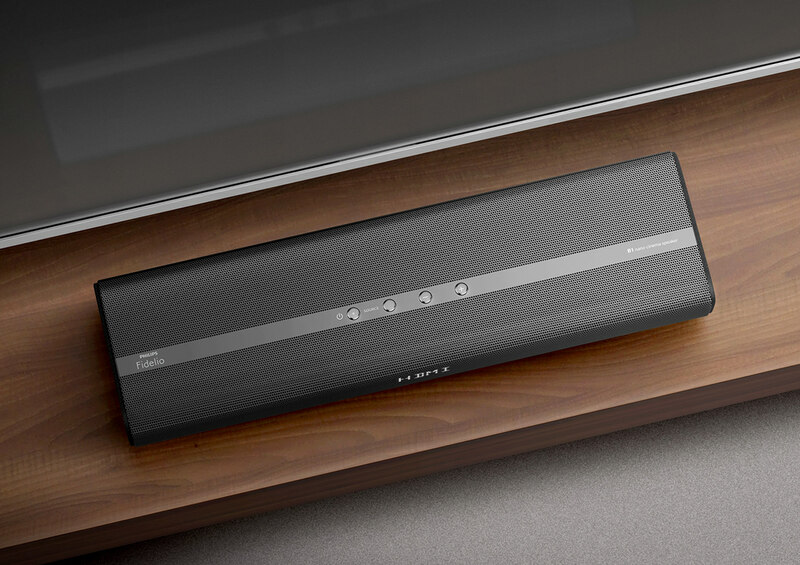 The compact soundbar is an extruded-like form with a low profile to avoid obstruction of the TV screen. The cross section profile is based on a soft blend between a circle and a square (which we called the ‘squarcle’) which relates with many of our home cinema products. A full piece of steel carbon speaker grill wraps from the front over to the top and folds over the bar. 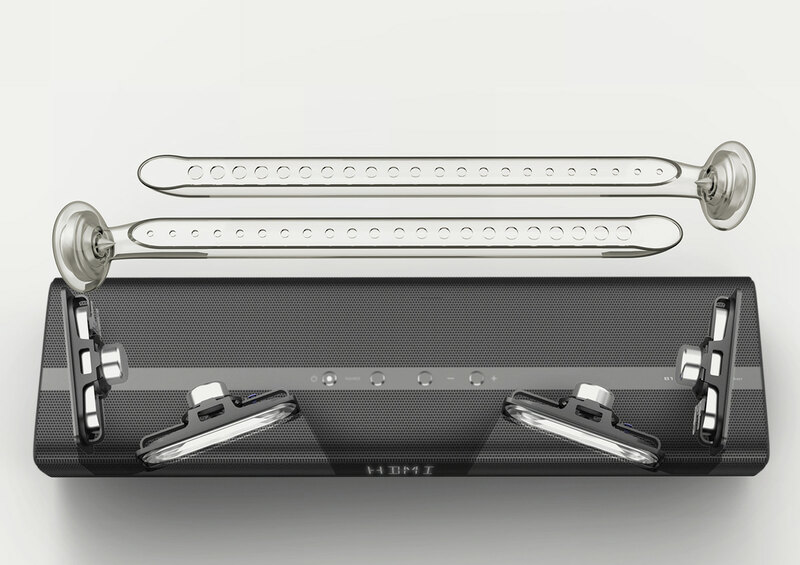 A blind trip on the top of the speaker grill is reserved for placing 4 control buttons in the centre of the bar. Each of the 4 buttons is capped by an aluminium cover with a diamond cut on the edge to reveal the authentic aluminium finishing. On each end of the bar is capped by a cloth speaker frame which house the angled side firing full range drivers. 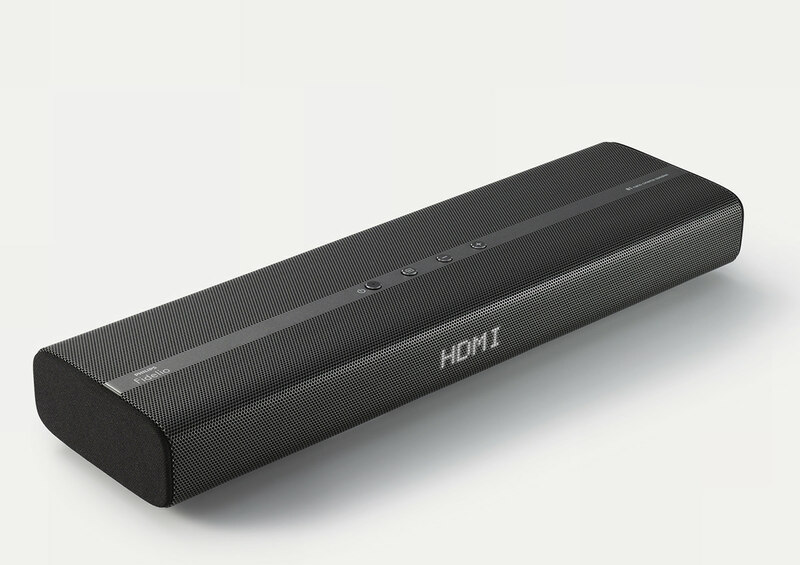 An exposed LED is placed in the power button to show when the soundbar is on. A brushed vinyl in black is chose to wrap the wooden subwoofer box. On the plastic stand, the edge of the side profile is polished to contrast with a matte textured top. 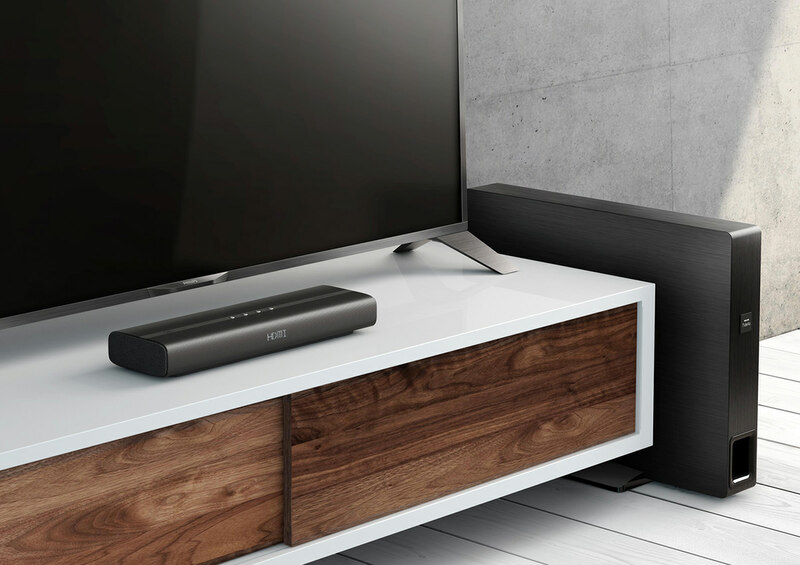 The exposed rim on the bass port is shaped in a squared profile with rounded corners to complement the slim rectangular wooden speaker box. 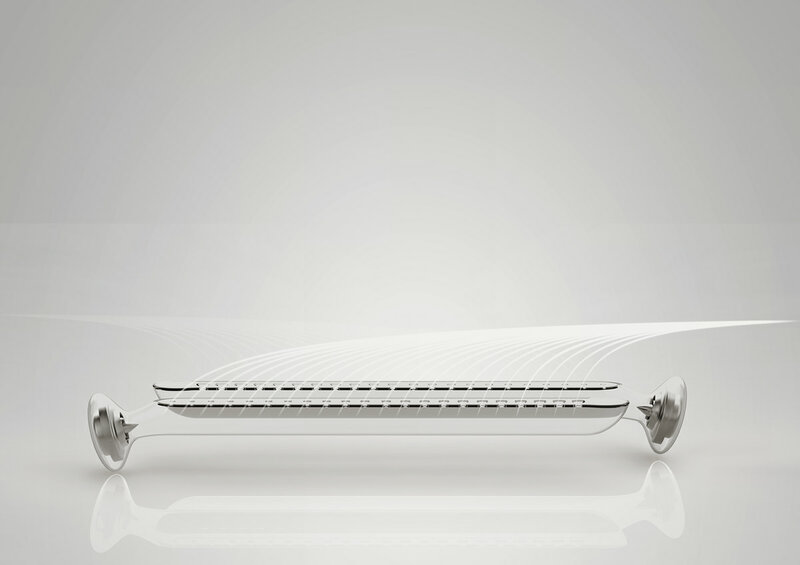 The design of the one piece continuous metal grill in combination of the speaker cloth side cap is to suggest sound beam to all sides. 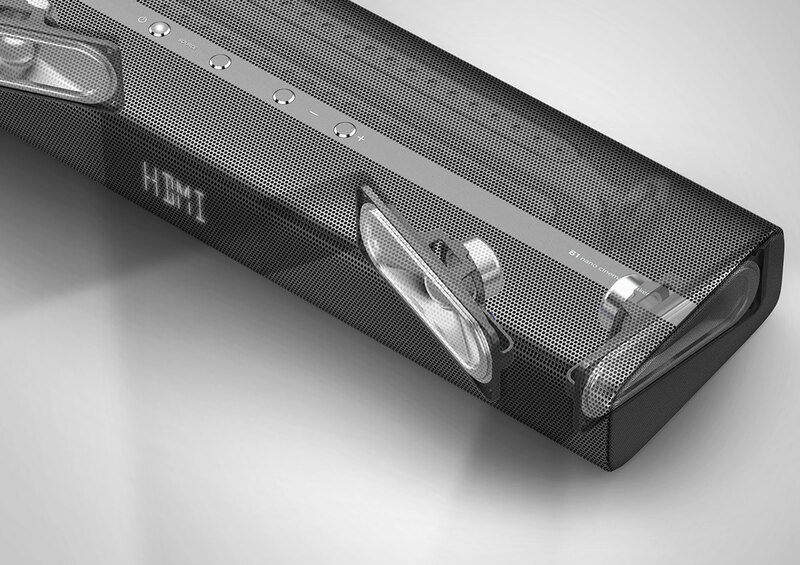 The design intention of creating a blind strip on the top of the sound bar is to visually suggest a separation between the front speaker array and the 2 high frequency speaker wave guide located on the back side.Both end caps are covered by speaker cloth to be treated as a softer finishing touch in contrast with the solid metal body. The subwoofer is designed with a seamless speaker box with the woofer driver sealed hidden inside the box by applying a bandpass acoustic concept design.A plastic stand is provided for free standing vertical placement. 4 optional rubber feetis offered forplacing horizontally under furniture.